Perfectly intuitive, endlessly versatile and constantly thrilling to use, Novatron is a true character compressor and saturator that just makes everything sound great. Very versatile despite ‘fixed’ ratios. A minor revolution in metering. 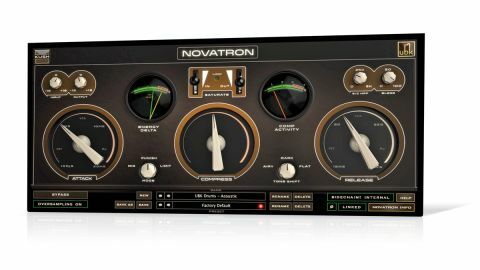 Gregory Scott’s latest compressor plugin, Novatron (VST/AU/AAX), is another highly ‘personal’ design from the DSP wizard, drawing on the behaviours of a number of unnamed hardware classics. These properties aren’t presented ‘modally’, however - ie, you don’t switch between discrete emulations. Rather, they’re infused in the architecture organically, coming together to create a wholly unique and remarkably versatile dynamics processor with a sound and character all its own. Novatron’s compressor section is bookended by two transformer circuits, as discussed in Utter transformation. In the compressor, the level threshold above which gain reduction takes place is governed by the Compression dial, while the compression ratio is just one of several under-the-hood parameters switched with the Mode knob, the others being knee shape, release taper and “harmonic character”. The three Modes are Mix, Limit and Punish, clamping down on threshold breaches at 2:1, 6:1 and 20:1 ratios, with soft, medium and hard knees, and program-dependent, linear and logarithmic release slopes, respectively. Key to Novatron’s sound and individuality are the Attack and Release controls, which morph through FET-, VCA- and Vari-mu-style timings and characteristics. Thus, you could set the knobs to define (in oversimplified terms) the tight, speedy attack of a dbx 160 with the fat, languid release of a Fairchild 670, for example. The Attack ranges between an insanely fast 100 microseconds and 30ms, while Release times run from 15ms to 1.2s; and the coverage of the FET/VCA/Vari-Mu modelling is indicated by the legending on each dial. At the start and end - a first for compressor design, Kush reckon - of Novatron’s signal path are a pair of transformer circuits for applying analogue-style saturation at both input and output. The drive level of each transformer can be set individually, or the two can be linked for simultaneous adjustment - we’re not entirely clear on the operational thinking behind the latter. The Input transformer pushes odd harmonics for potentially roughening and toughening of the source signal prior to compression, while its Output partner boosts even harmonics for post-compression warmth of the more musical kind. Kush is renowned for the quality of its transformer emulation algorithms - indeed, the Omega range of plugins is dedicated entirely to the concept - so it comes as no surprise that Novatron’s dual transformers sound palpably ‘physical’, with all the grit and heat of the real thing. When switched away from its Flat setting, the Tone Shift knob activates one of two pre- and post-compression shelving filter setups: Dark and Airy. Each colours the high frequencies as its name suggests, gently rolling them off or lifting them a touch for emphasised shimmer on cymbals, guitars and the like. The brilliant Energy Delta meter’s superimposed input and output level variation needles provide excellent visual feedback and make level matching a snap. There’s also a regular RMS gain reduction meter. Finally, the sidechain (internal or external) high-pass filter reaches all the way up to 3kHz; the Blend control sets the wet/dry mix; and the buttons in the bottom bar toggle Oversampling, stereo Link and phase invert. With its straightforward control set, task-specific Modes and ingenious metering, Novatron is supremely easy to set up. Whether you’re just using it to beef up a drum bus or transparently smooth out a mix, or indulging in more experimental dynamics shaping and limiting, the sheer scope of the plugin is far wider than the GUI might suggest; and the Dark/Airy Tone Shifts are nicely effective at instantly tilting the overall flavour. Indeed, it brings to mind Empirical Labs’ legendary Distressor in its chameleon-like ability to flip between response characteristics, degrees of transparency and sonic styling, as well as its handling of transients. Another essential boutique offering from a true master of saturation and compression modelling, Novatron is an instant classic.